Why use Predator MDC with MTConnect? NOTE: Predator MDC supports MTConnect v1.4, v1.31, v1.3, v1.2 and v1.1 simultaneously. MTConnect support is included with the purchase of Predator MDC. Leverage the power of MTConnect with Predator CNC Service to provide intelligent software based machine monitoring via Ethernet. Predator CNC Service supports machine operation modes, cycle counters and more for all makes and models of MTConnect enabled CNC Mills, Lathes, Routers, Lasers, Grinders, EDMs and CMMs. Predator MDC supports up to 100 additional MTConnect tags should additional details be required. Unfortunately, not all MTConnect agents and adapters include every MTConnect tag. Refer to the documentation provided by the MTConnect agent and adapter for which MTConnect tags are included. Some MTConnect vendors charge extra for some MTConnect tags. MTConnect agents or adapters may have to be purchased or installed by the machine builder or machine distributor. NOTE: Predator MDC supports up to 100 additional MTConnect v1.4 tags per machine or device. NOTE: Predator MDC supports up to 100 additional MTConnect v1.3 tags per machine or device. NOTE: Predator MDC supports up to 100 additional MTConnect v1.2 tags per machine or device. NOTE: Predator MDC supports up to 100 additional MTConnect v1.1 tags per machine or device. Does Predator MDC support MTConnect Version 1.5? No. Version 1.5 of MTConnect has not been released. 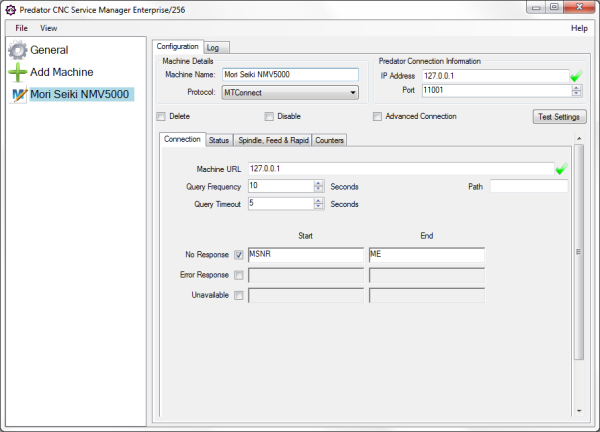 Predator MDC will provide support for MTConnect version 1.5 after it has been released. We are committed to supporting MTConnect but only after each version is officially released. Does Predator MDC support MTConnect Version 1.3.1? Yes. Version 1.3.1 of MTConnect is fully supported. Within Predator CNC Service simply select v1.3 in the MTConnect Version pulldown. Does Predator MDC support MTConnect based hardware? Yes. Predator MDC supports MTConnect based hardware from a number of manufacturers.